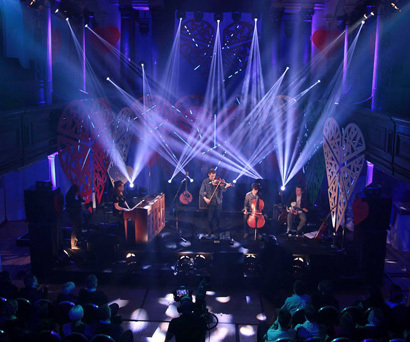 The Dublin-based company JustLite recently supplied Ireland’s unique music event, Other Voices – which is transmitted globally online and as a television series – with 19 CHAUVET Professional Legend™ 230SR Beam fixtures. Shooting inside the Glassworks venue, for the Derry leg of the show, the lighting set, designed by Liam McCarthy, made the stunning CHAUVET Beams the central focus of the stage. Now in its twelfth series, Other Voices began as a one-off music show at Dingle Church (West Ireland) before becoming a popular series across the country and beyond; with the quality of the music propelling the show’s success. Now also a presence in Derry, London and New York, Other Voices attracts an expanding array of artists from across the musical spectrum and past performers include such high-profile acts as Amy Winehouse and Ellie Goulding, amongst many others. The format of the show is a music and arts event plugged into and evolving through every dimension of content programming, event formats, and distribution channels. The CHAUVET Professional Legend 230SR Beam has become the fixture of choice for creating the current on-trend look every band strives for in their live show, and JustLite used 19 of them to great effect as part of the Other Voices lightshow. Generating a powerful beam from its 230-watt Osram Sirius lamp – which outputs an intense 96,000 lux at 15 metres due to precision glass optics and a 2.25-degree beam angle – this compact and agile unit delivered a powerful lightshow. For further flexibility the fixture offers zooming, 8-facet prism, auto-focus, 17 GOBOS, and colour wheels featuring 14 colours plus white – resulting in seamless split colours and an array of atmospheric effects. With the recording of Series 12 complete, Other Voices will appear soon on television and across online platforms. This latest series includes performances from George Ezra, The Gloaming and many other artists.